A few students in the TSP lab have papers to present in poster sessions at INTERSPEECH 2011. Congratulations! 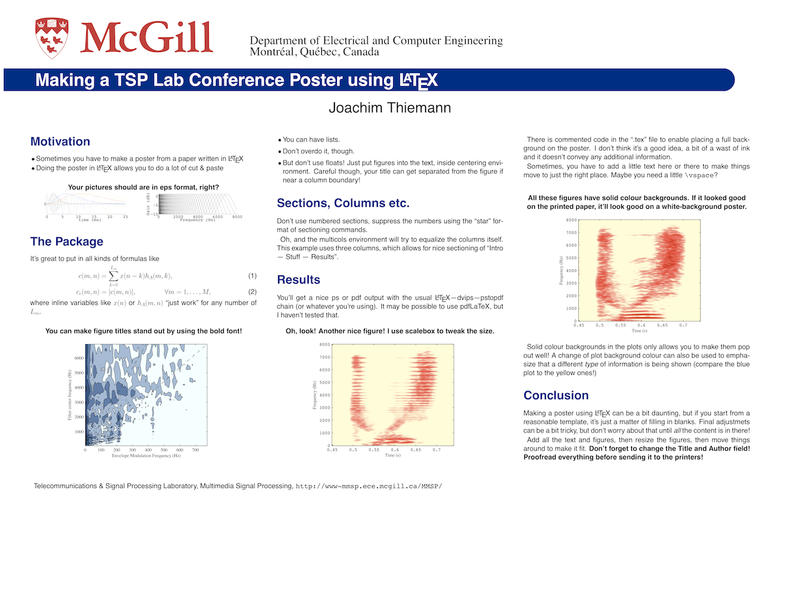 In the past, the TSP Lab students used to use PowerPoint to create the posters - a bit of a kludge, and if the submitted paper was written using LaTeX, it might mean having to re-enter the equations (in addition to all the other annoyances of PowerPoint). This pain can be avoided by doing the poster in LaTeX as well, as I did for my INTERSPEECH paper (see "Reconstructing Audio Signals from Modified Non-Coherent Hilbert Envelopes" on my research page). I used the a0poster package, and while it can be a bit daunting at first, with a good template it's quite easy to use. I've modified my own poster to be a small guide, with explanations: see inside the TSP Lab Template Package. It contains the a0poster class (probably an older version), and the McGill logo.